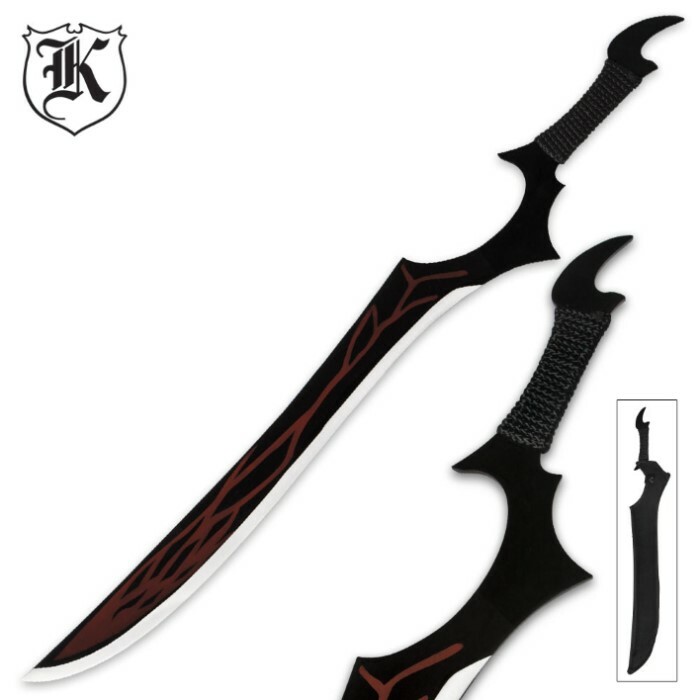 Julie Sigtuna Blaze Sword | BUDK.com - Knives & Swords At The Lowest Prices! Inspired by the Japanese light novel series, Absolute Duo, the Blaze Sword is an astonishing replica of the sword carried by Julie Sigtuna. 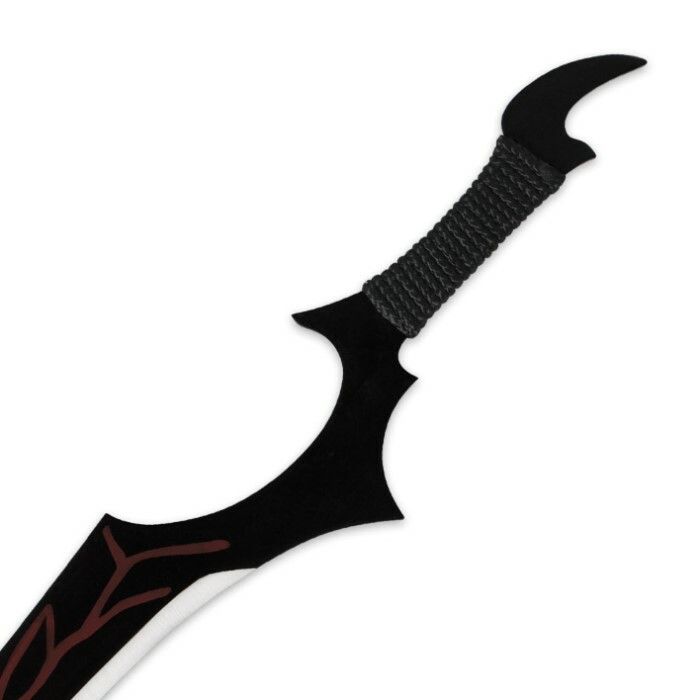 The full-tang carbon steel blade is black plated with a signature red design. The handle is wrapped with nylon rope and a black nylon sheath completes the package. FIRST PROBLEM: the blade is shiny all the way to the point of the guard. the shape is right, but the paint's off in that essential curve. SECOND PROBLEM: the description is waay off. the black leather sheath is nylon. 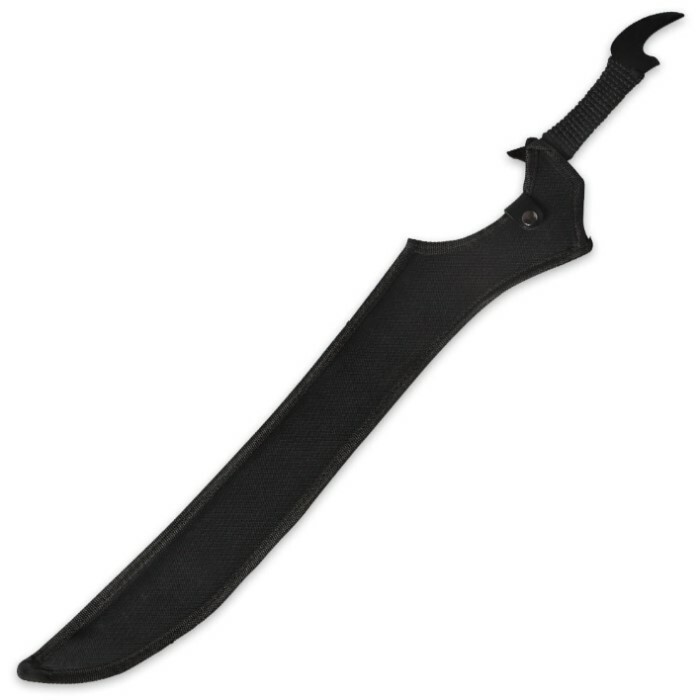 it's almost like the one in the picture, except it's about 1 1/4 inches too long, and thus creased at the end, and, the tip of the iceberg it has no beltloop, so the sheath can hold the sword... but there's nothing to hold the sheath. it also came dirty. not just oil, but glue. gonna have to fully redo the paint, and i'm not all that pleased with the sheath. more disapointed about a lack of belt loop than the nylon sheath, as on closer inspection, the black sheath in the picture is nylon. Positive points (the reason it gets a second star) while the details are over-looked and it has to be repainted, the steel is solid and sturdy. holds a dullish edge fairly well, and makes a great machete. was actually surprised by it's durability. blade is 1/6 inch thick. and the design puts plenty of extra weight into the swing to be used as a decent machete.